As you may or may not know, my ‘Big Birthday’ is gradually looming closer and closer – I’ll be the big 3-0 in June, eeeek! Where the heck has my life gone!? 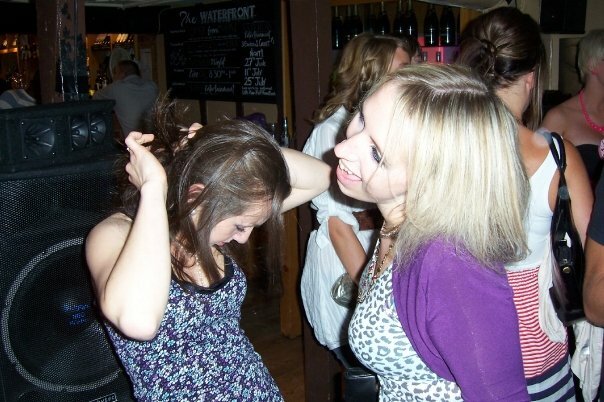 As well as writing this post about my best friend (check us out dancing the night away above) and reminiscing about our reckless days of old, it’s come to my attention that I simply can’t hack nights out any more! I went out with my friends the other week, and had three drinks *three* single shot drinks, and woke up with a banging skull ache the next day! I mean WTF!? I used to love nothing more than a Thursday night on the town – it was student night so drinks were cheap, we would get home at 4am and I’d be at work in the morning by 8. Then back on it again Friday and Saturday nights too. Urrgh this sounds like my idea of hell now! I just can’t be bothered with it any more! I actually love nothing more than a Friday or Saturday night in, with a big posh pizza, snacks and a DVD, it’s my idea of heaven now! Does this mean I’m an old fogey though?? Well, it appears even real life proper surveys agree with me! It turns out nearly 70% of women prefer a girls night in (according to a survey by Ladbrokes Bingo) Would you believe it! Apparently 60% said long queues at bars were the most annoying thing, and the same percentage said they’d prefer a night in just because it’s cheaper – this doesn’t surprise me! Now don’t get me wrong, I’m not a complete hermit, I do love going out with the girls for a couple of bevs, but maybe not every weekend any more!